Photo at left [posted May 19, 2015) from Dale Vanormer, a C-DET Certified Technician. Dale says he sees situations like this "once a month down here.. the flex stuff twisted so much at termination a dime size hole remained...not to mention Dyer hookup was terrible." ​This is a salon in Jeremy Laures' service area that has seven dryers with only four actual terminations outside. Two were completely plugged, with dryers running! Photo 3/16/15 courtesy of Laures in C-DET Dryer Vent Jobs. 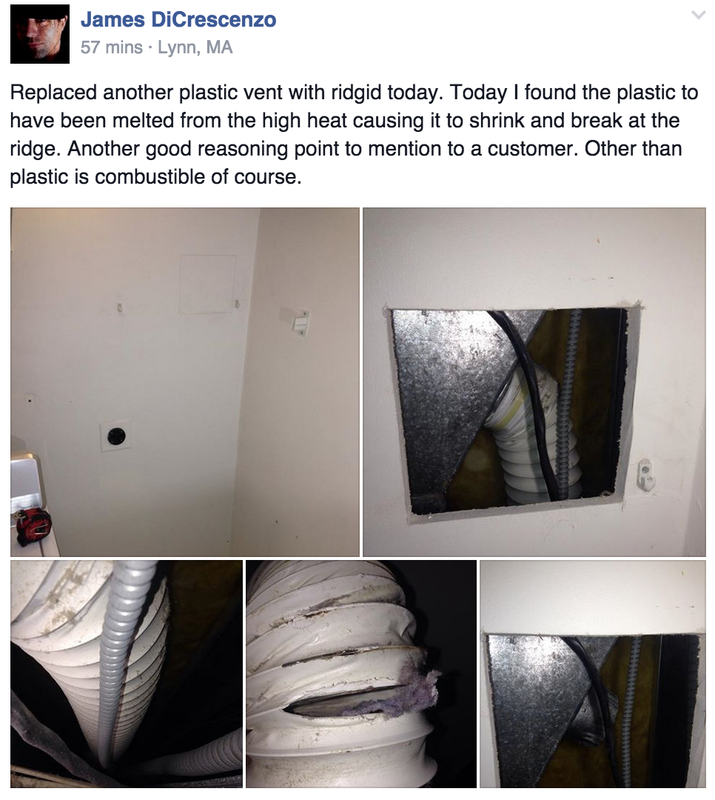 3/13/15 - Plastic vents! The exhaust hose that connects from your dryer to the wall thimble should be the right material. Here's what happens when it's not. Courtesy of James DiCrescenzo.